Measurements: Square cards: 3.5 x 3.5 inches; or 90 x 90 millimeters. Back of card: Black with thin white lines: concentric circles with mandala that reminds us of the Kabala. Book included: Yes, 158 pages, square: 8.5 x 8.5 inches, 219 x 219 mm. In color, with full description of each card, suggested card layouts (including an astrological layout), meditation suggestions, etc. Publisher: Thorsons/HarperCollins. Printed in China. Comments: One of the few astrological tarot decks to get to a full 78 cards (most other astro-tarot decks have only 12 sign cards, 12 house cards, 12 planet cards & a few extras). So Mann has fun illustrating the traditional cards with astrological symbols. Sword 6 has six swords arranged in a Star of David (six sextiles) with Mercury in Aquarius. Cup Princess is the Water Palace with a Grand Trine inscribed in the center, the Pentacle King shows Taurus, clutching a pentacle, with a crown on its head. To the left is Venus, to the right, the Moon. The Major Arkana cards have the number in the upper left, a Hebrew character in the upper right, a planet in the lower left, another planet in the lower right. On the top, the name of the card, on the bottom, the sign of the Zodiac that best suits it. A big change from most other decks: None of the cards use human characters to convey the meanings. Astrologers can have a lot of fun with this deck. Established 1993, The Astrology Center of America is owned & operated by David Roell. Except where noted, this entire site (AstroAmerica.com) & its contents are Copyright © 1996, 1997 by William R. Roell. All rights reserved. 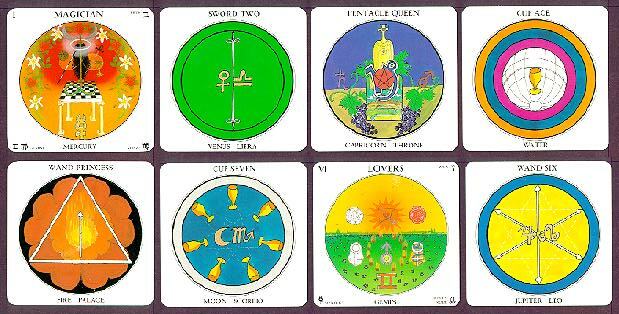 Tarot card images are Copyright © by the copyright holder (generally the publisher).